Websites Get In On April Fools' Day : Blog Of The Nation Welcome to April Fools' Day in the Internet age! Ever since last year's April 1st, when Google changed its name to Topeka for the day, I have been anxiously awaiting this year, to see what kind of shenanigans the web's most popular sites would pull. YouTube is celebrating its 100th anniversary by featuring the most popular viral videos of its inaugural year - 1911. Google is introducing Gmail Motion, so you "can control Gmail with your body." And Hulu is headed back to the nineties, not only offering some of the decade's most popular programs like The X-Files and NewsRadio, but is featuring a new interface as well! The new Hulu operates at dial-up speeds (remember having to wait for the picture to load) and is "best viewed in Netscape Navigator." 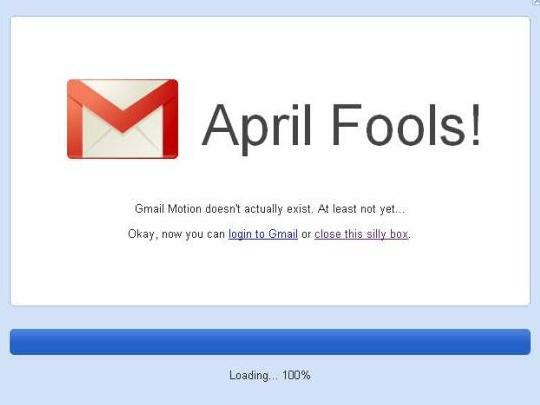 Welcome to April Fools' Day in the Internet age! While some old curmudgeons might long for the bygone days of good ole' fashioned pranks, I welcome the web's embracing of the holiday. Ever since last year's April 1st, when Google changed its name to Topeka for the day, I have been anxiously awaiting this year to see what kind of shenanigans some of the web's most popular sites would pull. So, in the spirit of April Fools' Day, here are my favorite Internet pranks that I have run across today. 1. Hulu.com, the popular video streaming site, has redone their entire homepage to make it look like a website from the 1990s. It features popular shows from the decade and at the end of each clip you're subjected to that horrible dial-up sound. Be warned: when you visit the site you may want to make sure no one is using the telephone, as it may mess with the Internet connection and drop the call. *For confused tweens wishing to view the latest Glee episode, don't fret. Hulu provides a "back to the future" option. 3. YouTube celebrates its 100th anniversary by honoring the most popular videos of its inaugural year. They are also providing an option for users to have any video that doesn't have ads reconfigured to look like it would have had it been uploaded in 1911. In other news, Talk of the Nation is offering $1000 to anyone who subscribes to our podcast today. Just kidding! Happy April Fools' Day everybody!